We have rounded up an amazing group of 40 outstanding alumni from many seminar years who are living all over the world, working in many fields, and impacting our world in tremendous ways. We hope you will follow along everyday as we feature a new alumni daily for 40 days leading up to our 40th seminar. Day 1- Angela Wellsmith. Angela was integral in building our alumni association in the early 90s and was one of our first ever Alumni Association presidents along with being a past Alumni Advisor and member of our Board of Directors. She attended seminar in 1992 representing Waukesha South HS and currently resides in Brookfield, WI. After high school she completed both her undergraduate and law degrees at UW-Madison and served as student body president while she was there! As Senior Corporate Counsel at Kohl’s Department Stores, Inc. she is responsible for product safety matters company-wide, providing legal advice to several departments, including logistics, purchasing, credit and more, and negotiating most of Kohl’s technology matters. Angela is also the VP of Communications for Brookfield’s Junior Lancer Football organization. Beyond being involved in her children’s sports, her and her husband Peter (who got engaged on stage at Comedy Sportz while chaperoning a reunion) give spare time to WILS as they can, and they budget annually to ensure that they contribute to WILS each year. When asked how WILS helped her grow as an individual and gain skills that have made her successful in her life, Angela replied: WILS was the first time I was around a large amount of leaders like myself from all over the state. It was so empowering, and it gave me a network of people to coordinate with while giving back to my school. We were fortunate enough to have a core group that continued on to grow the alumni group, and continued to increase our leadership skills through regular meetings. WILS gave me confidence to stand out, even when it wasn’t popular to do so at school. 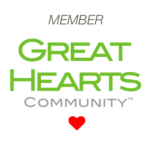 I have remained involved in the organization and remained close to other WILS people for 25 years. I can think of no better endorsement than that – WILS is incredible. 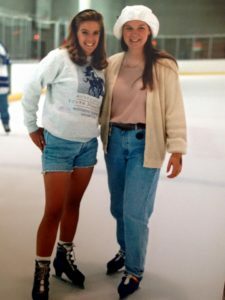 Pictured on the left is Angie at a Milwaukee reunion in the mid-90s with Tanya Kruse Ruck, the 1992 representative from Waukesha North HS and currently a professor of vocal performance at UW-Milwaukee. Tanya and Angie are still best friends! Day 2 – Have you ever marveled at amazing outdoor spaces like public parks, school playgrounds, or urban roof gardens and wondered who has the awesome job of planning these gems? It might just be former WILS Alumni Board member and Badger alumnus, Becky Rupel. Becky represented Whitnall High School (Greenfield, WI) at the seminar in 2006. 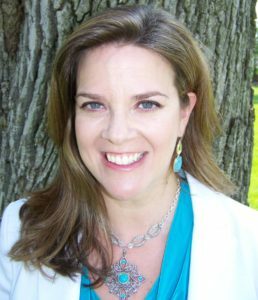 She currently lives in Medford, Massachusetts and works as a project manager and licensed landscape architect with Copley Wolff Design Group. 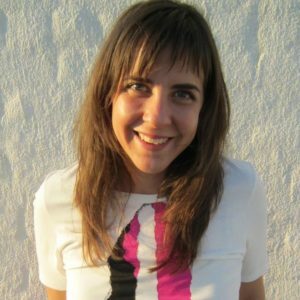 She’s also on the emerging professionals committee of the American Society of Landscape Architects. 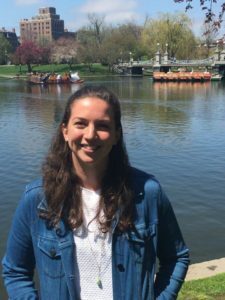 Within her community, Becky is a big sister with Big Sister Boston and she volunteers with local environmental advocacy groups. Recently she also began using her talents to illustrate picture books. When asked how WILS helped her grow and attain skills that have made her successful, Becky noted: My involvement with WILS had so many positive impacts on me, but the biggest was (and still is) the network of friends and mentors that have inspired me, supported me, and pushed me. At the same time, working with the alumni association independently from my family or friends at school was a really valuable bridge to the “real world.” If I hadn’t arrived that first day of seminar and dove in, knowing nobody, it’s hard to imagine having made multiple moves across the country, showing up cold to job interviews, or taking much of the initiative I have as an adult. 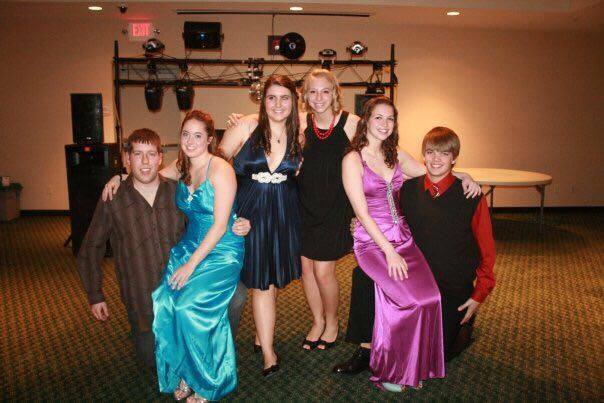 Check out Becky in purple in this picture from winter reunion 2009 with fellow alumni Steve Stan Stangel, Dani Marie, Rhianna Farrell, Abbey Thereasa, and Erik William (current member of the WILS Board of Directors). Day 3 – If you read the New York Times, Guardian, Bust, Toast, Salon, Observer, Brooklyn Rail, or Curve magazine then you might have read the work of accomplished writer and WILS alum Amy Deneson. Amy lives in New York City where she writes about art, books, and traveling and she is currently working on her first book. She also writes about growing up in a religious family, in which they didn’t see eye to eye. In high school writing for her was about survival but now her writing is about exploring the world she lives in and being part of the one she hopes to help create. • I wasn’t the only one. • Other people were thinking what I was thinking, too. We needed to speak up to find each other. • What’s “normal” is different for most people. • Not to take photos of everything. • Sometimes we lead others; sometimes we follow others—most often at the same time. • We can agree to disagree respectfully but also acknowledge what a wonder it is when someone helps to change our minds. • How to create a chosen family. • To try. I almost skipped my seminar. 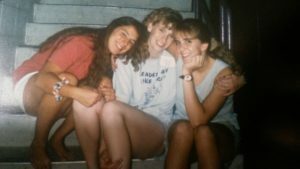 Amy is pictured on the right in this trio with Dena Peroceschi-Sprain and Sarah Perkins Simmons (current President of our Board of Directors) at the 1996 summer reunion. Day 4 – Today’s featured WILS alumnus is no stranger to the spotlight. Susan Fochs has been incredibly involved in the Miss America Organization for the past 6 years and currently holds the title of Miss Door County 2017. In her role Susan serves as a goodwill ambassador for Children’s Miracle Network Hospitals. Her title also allows her the unique opportunity to promote her platform, Operation Not Alone. Susan was inspired to found the non-profit organization Operation Not Alone a number of years ago by watching her father, who is a disabled Marine veteran, overcome obstacles to succeed through his limitations. The organization creates and sends unique care packages to our troops. In just a few days, Susan will graduate from UW-Oshkosh where she was recently awarded the Chancellor’s Award for Excellence. 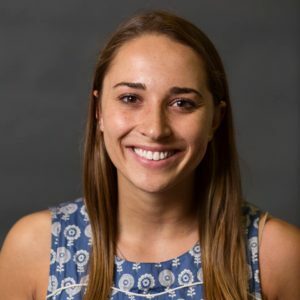 While attending UW-Oshkosh she volunteered for years with the Make-A-Wish Foundation and served as the Special Events and PR Intern for the Make-A-Wish Foundation of Wisconsin in Appleton for the past year. Susan is also a member of the Gamma Phi Beta Sorority and served as Treasure, Vice President and President. Susan will be competing for the title of Miss Wisconsin 2017 during the seminar this year and we wish her all the best! 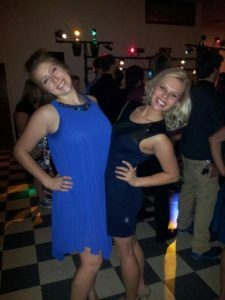 She is pictured with Hanna Wienke (current Alumni Association Co-Advisor) having a blast at the 2012 winter reunion. Day 5 – Our featured alumnus today is board certified plastic surgeon Dr. Mark Bosbous. Mark completed his undergraduate degree at the University of Notre Dame, his medical school and residency at the Medical College of Wisconsin, and his fellowship in aesthetic and reconstructive breast surgery at Partners in Plastic Surgery of West Michigan. Mark represented Pius XI High School at the 1995 seminar and currently resides in Elm Grove, Wisconsin where he works for Froedtert and the Medical College Community Physicians. Mark specializes in general plastic surgery including cosmetic surgery, reconstructive surgery including breast reconstruction, treatment of skin cancer and hand surgery. 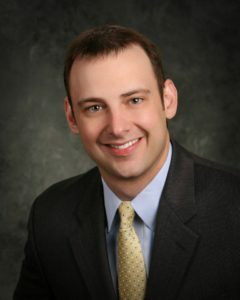 He serves as the surgical CSU director (chief of surgery) at West Bend St Joseph Hospital along with being a member of the West Bend Surgery Center Board and St Joseph’s medical executive committee and serves as the plastic surgery quality program champion. In his field he is also a member of the community physicians compensation committee and a case reviewer for the hospital performance improvement committee. He stays involves at his alma mater on the Medical College of Wisconsin Alumni Board. Outside of work Mark has a passion for furthering cancer research and serves on the Wisconsin Breast Cancer Show House Scientific Review Committee and is a member of the West Bend St Joesph Kraemer Cancer Center fundraising gala committee. When he is not working or serving on professional or community boards, Mark loves to golf, play tennis, and most importantly spend time with his wife, Katie, and his daughters Peyton, Madelyn and Caroline. He volunteers as assistant soccer coach for his daughter’s soccer team and as a t ball coach at St Mary’s Elm Grove. When asked how WILS helped him grow as an individual and gain skills that have made him successful in life, Mark had this to say: WILS was a wonderful experience. 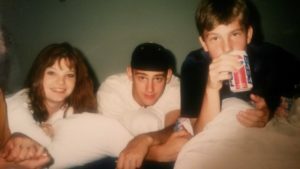 I attended the conference and then served as a junior counselor and then counselor in the years that followed, forming lasting relationships with wonderful people. The conference itself and participation in the years that followed allowed me to continue to develop leadership skills and grow confidence in leadership situations. WILS allowed me to be around like minded young leaders and to be vulnerable in sharing hopes and fears while building each other up and gaining confidence to take on leadership and service roles throughout my life. Mark is pictured here at the 1995 summer reunion hanging out after a scavenger hunt on State Street in Madison. Day 6 – When it comes to conducting and utilizing research to make positive changes in our communities, WILS alumnus Melissa Ertl is dedicating her time to being a catalyst for change. 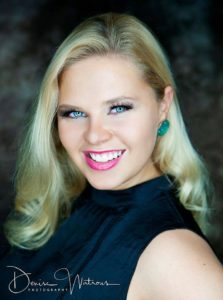 Melissa hails from Park Falls, WI and represented Chequamegon High School at the 2009 seminar but she currently resides in Albany, New York where she moved after completing her undergraduate degree at UW-Madison. She is a PhD candidate at the University at Albany-State University of New York studying Counseling Psychology and Health Disparities. Her current work entails engaging in research on a P20 National Institute on Minority Health and Health Disparities (NIMHD)-funded longitudinal study investigating the social and cultural determinants of health and health risk behaviors among recently immigrated Latina young adults. For the past two years she has conducted statistical analyses and contributed to academic manuscript writing on papers that examine social and cultural influences associated with health risk behaviors (e.g., alcohol use, drug use, inconsistent condom use). The aim of this research is to inform prevention interventions for Latinas immediately after immigration so as to reduce and eliminate health disparities. As a part of her program, she is also a counseling psychologist trainee engaging in therapy at a community mental health center in Albany with diverse clients who present with a range of concerns. Apart from classes, therapy, and research in her program, she likes to travel to academic conferences to present on her research and learn about the work of others in academia. Melissa is involved in several psychological organizations, including the American Psychological Association (APA)’s Division 17, the Society of Counseling Psychology; APA Division 35, the Society for the Psychology of Women; and the Running Psychologists, who organize a 5K each year at the annual APA convention. Outside of work, she runs full and half marathons and loves to travel. 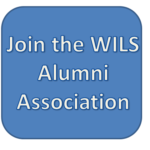 When reflecting on WILS, Melissa said: WILS was an invaluable experience that I continue to appreciate as I approach a decade separation from my first seminar. I met some of my best friends through WILS! As a result of attending seminar, I have created strong lifelong connections with other leaders. I also learned my style of leading and have come to embrace the way that I work with others. For several years after I attended my first seminar, I was a Junior Staff and later Facilitator for WILS, which were really phenomenal experiences to engage with young leaders in Wisconsin. I also credit WILS with expanding my mind and opening me up to a diverse group of young people who were all leaders and high achievers. 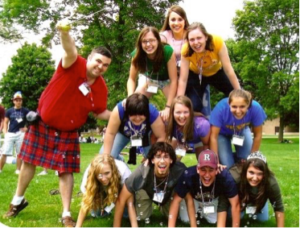 Check out Melissa at the top of her group’s pyramid at her original seminar in 2009! I see some other familiar faces in there – Derek Johnson, Rhianna Farrell, and Laura Heintz (Yundt).